Isaak doesn't walk anymore. He jumps, bounces, and runs into things. He looks like a drunk 5 year old when he runs into stuff. Isaak's obsessed with kissing, and eyeballs. He jokes about kissing people on the lips, and laughs. Oh we've corrected him. I remember Mica doing the same when he was Isaak's age. When we ask Isaak what he wants to eat? 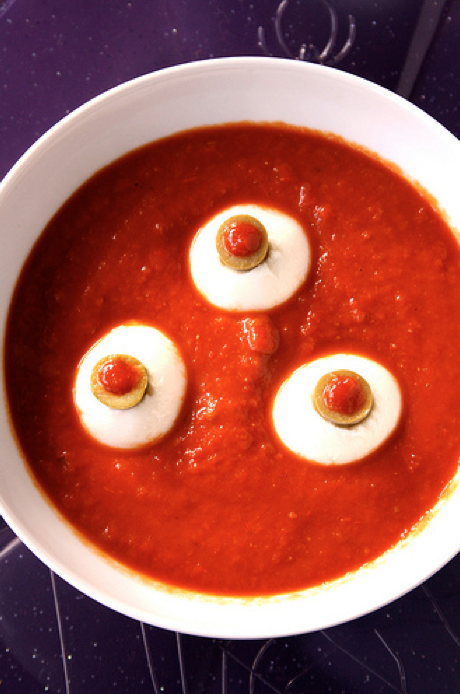 He says, "Eyeball Soup" and giggles like it's the funniest thing in the world. It must be Kindergarten humor. Sometime I should make him some eyeball soup just to see what he'd say. Source - It would have to look more realistic than this one though. Mica had a dry spot under his chin. He's never been dry there before. I had him apply coconut oil for awhile. Then we tried lotion. Now he has a huge pimple there. Poor kid! It's too early for puberty. I've been putting a hot washcloth on him to try and get it to go away. Honestly I'm at a loss for the poor kid. If lotion and coconut oil don't fix the dryness issue, and clog up his pores, what's a boy to do? I like rules, but only sometimes. I'm not big into blogging rules. For instance I don't like when people say on their blog, "You have to put WW in front of your post, and put my badge on your blog to link up." I don't have time to put your badge on my site, and what makes your site so much better than others to have a special WW badge? Sure have it, but why demand it? Often times I link up, and just comment. They usually are the ones that never comment back anyhow. I eat 4 times a day now: Breakfast, 10 AM snack, lunch, 3 PM snack, and dinner. Sometimes I miss eating a snack after dinner. For 1 of my snacks it's usually humus and veggies, or gluten free crackers. Apparently many of my students have never had Humus before. I've heard a lot of, "What's that?!" When I tell them they stick their noses up in the air and say, "Yuck!" I think humus is GOOOOD! I should start drinking my steamed veggie broth in front of them. It looks way worse than eating Hummus. Have you had Humus? Do you like Hummus? 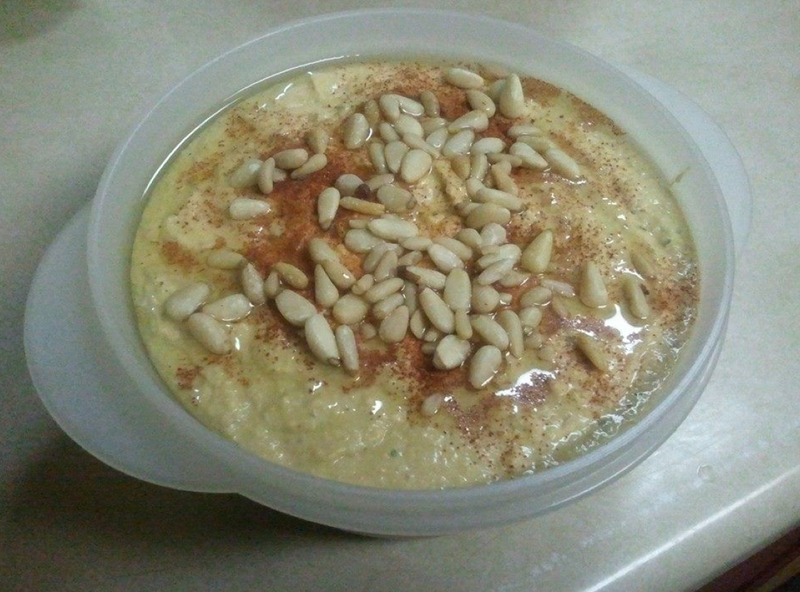 Homemade Hummus made by Daddy with Pine Nuts on top. It's funny the things they get on kicks about. I am sure the eyeball thing will pass, but it could definitley be worse. I don't like blogging rules either. I don't follow most of them, but then again, I've kind of stopped linking up to other blogs lately. I haven't done WW in a few weeks and I'm not sure if I will again. We'll see. I was so tired of commenting on all the other blogs, then most wouldn't comment back, so I would put my link in a few, then go through my blog and only comment on those that left one for me. I saved a lot of time that way! I'm guessing both of the boys would love it if you made eyeball soup, hahaha! I know what you mean about people not commenting. So annoying. I do like Humus.. a lot. I have some in my fridg that I will eat with my lunch today. My Hubs hates it.